MIAMI, Florida (CNN) -- Criminal charges were filed against the co-owner of a Florida clinic where a teenager claims she sought an abortion, but instead gave birth to a baby that the woman allegedly threw in the trash. Belkis Gonzalez has a prior conviction of unlicensed practice of medicine for incidents in 2004. 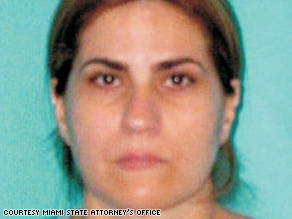 Belkis Gonzalez, 43, was co-owner of the now-defunct A Gyn Diagnostic Center in Hialeah, Florida. She faces a second-degree felony count of unlicensed practice of a health care profession resulting in serious bodily injury and a third-degree felony count of tampering with or fabricating physical evidence, authorities said Tuesday. She was arrested and taken into custody, prosecutors said. If convicted, she faces a minimum sentence of a year in jail. Authorities were unable to file more serious charges against Gonzalez because they could not prove the baby's exact cause of death. Nor could they prove that her actions brought about the death, according to Ed Griffith, a spokesman for the state attorney's office in Miami. The baby's mother, Sycloria Williams, sued the clinic, its staffers and Pierre Jean-Jacques Renelique, its doctor, last month. The Florida Medical Board also revoked Renelique's license last month. Although Renelique was not present when the baby was born, the medical board upheld Department of Health allegations that he falsified medical records, inappropriately delegated tasks to unlicensed personnel and committed malpractice. Williams claims she sought an abortion at the clinic on July 20, 2006, when she believed herself to be about 23 weeks pregnant. She was 18 at the time. She was told to wait for Renelique to arrive and given medication. When she complained of feeling ill, she said clinic staffers told her to lie down in a patient room. She waited for hours, Williams claims in her suit, and eventually "felt a large pain" and delivered a baby girl. Williams "observed the infant moving and making noises for approximately five minutes," according to an affidavit in support of Gonzalez's arrest warrant. Williams alleges that Gonzalez entered the room, used a pair of shears to cut the baby's umbilical cord, then "scooped up the baby and placed the live baby, placenta and afterbirth in a red plastic biohazard bag, which she sealed, and then threw bag and the baby in a trash can." The doctor later arrived and gave Williams a shot to put her to sleep, she alleges in her suit. In the affidavit, police said they found out about the incident when they received a tip the following day. They searched the clinic for the baby's remains but were unable to find them. Gonzalez gave police a statement, meanwhile, and "asserted under oath" that Williams' termination was done by Dr. Renelique while she stood at his side, according to the affidavit. She denied that the infant came out alive, police said, but statements from two other clinic employees contradicted her account. Six days after the first search, police received another tip that the infant's remains were placed back inside the clinic. They executed a search warrant and found the remains. They were linked to Williams through DNA testing, according to the affidavit. Documents from the state Department of Health say the baby's cause of death was determined to be "extreme prematurity." However, according to the police affidavit, the medical examiner could not definitively say that the baby had been born alive. A birth certificate was issued, because nothing in the autopsy findings disproved Williams' claim the baby was alive and moving. Experts told police the baby would not have suffocated in the bag because it would have had a limited ability to breathe on its own. And an expert reported there was no way to prove for sure that the baby filled its lungs with air because of its underdeveloped lungs, as well as its decomposed state when the remains were found. Another expert certified in neonatal and perinatal medicine told police he estimated Williams' fetus, based on data from her medical records, to have a gestational age of about 21 and a half weeks -- meaning it had not reached viability, the state where it could survive outside the womb. "This expert ... explained that the standard of care for a premature infant delivered at less than 23 weeks is not to attempt resuscitation," so even if the baby had been born at a hospital, no measures would have been undertaken to save it, according to the affidavit. In December 2007, Gonzalez was convicted of unlicensed practice of medicine for actions between August and December of 2004, and is serving five years' probation, according to the affidavit. However, because the 2006 incident preceded her probation term, she is not accused of violating her probation.